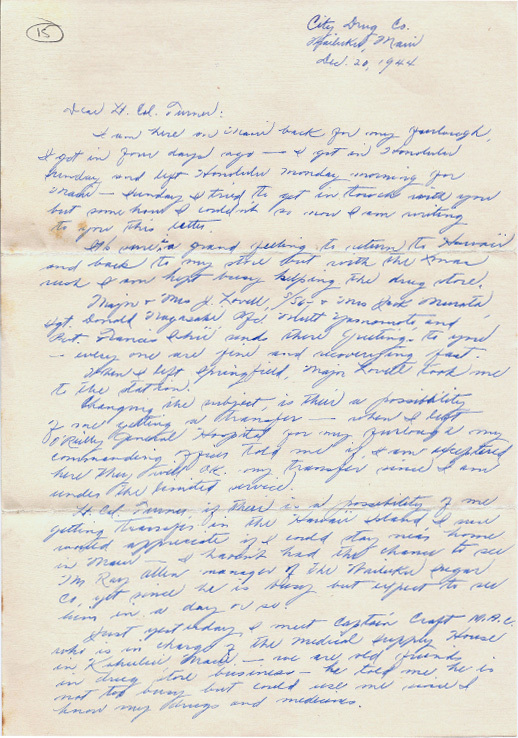 I am here on Maui back for furlough, I got in four days ago – I got in Honolulu Sunday and left Honolulu Monday morning for Maui – Sunday I tried to get in touch with you but some how I couldn’t so now I am writing to you this letter. It’s sure is a grand feeling to return to Hawaii and back to my store but with the xmas rush I am kept busy keeping the drug store. Major & Mrs J. Lovell, S/SG & Mrs Jack Murata, Sgt. Donald Nagasaki, Pfc. Mutt Yamamoto, and Pvt. Francis Ishii sends there greetings to you – every one are fine and recoverying fast. When I left springfield, Major Lovell took me to the station. Changing the subject, is their a possibility of me getting a transfer – when I left O’Reilly General Hospital for my furlough my commanding officer told me if I am exceptered here they will OK my transfer since I am under the limited service. Lt. Col. Turner, if there is a possibility of me getting transfer in the Hawaii Island, I sure would appreciate if I could stay near home in Maui – I hadn’t had the chance to see Mr. Ray Allen manager of the Wailuku Sugar Co., yet since he is busy but expect to see him in a day or so. Just yesterday I meet Captain Craft M.A.C. who is in charge of the Medical Supply House in Kahului, Maui – we are old friends in drug store business – he told me he is not too busy but could use me since I know my drugs and medicines. At present I don’t know what channel to go about so that I could be station here – another thing when I return from California on the Bomber to Hickman Field, & thought they’ll send me to the 13th casual center but they didn’t. I just reported to A.T.C. casual center, slept one night and the following day caught the 19th troop movement plane and came to Maui – I didn’t have any paper to report so I kind of feel funny since it was so easy. 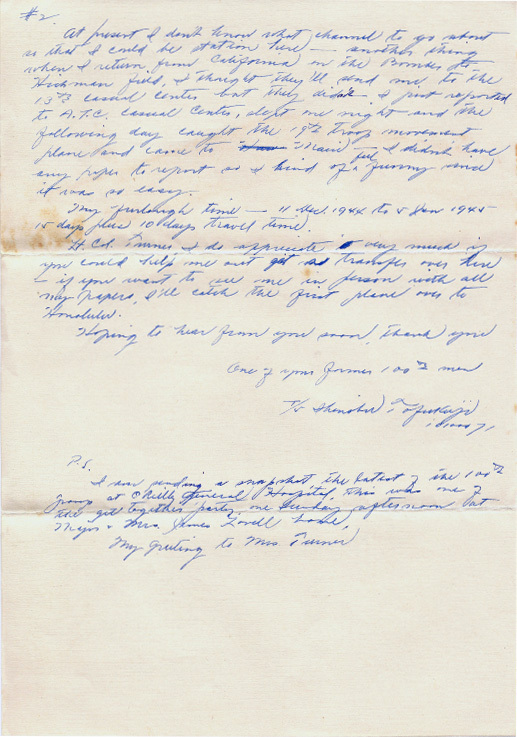 My furlough time – 11 Dec. 1944 to 5 Jan 1945 15 days plus 10 days travel time. Lt. Col. Turner, I do appreciate very much if you could help me out get a transfer over here – if you want to see me in person with all my papers, I’ll catch the first plane over to Honolulu. P.S. I am sending a snapshot, the latest of the 100th group at O’Reilly General Hospital. This was one of the get together party one Sunday afternoon at Major & Mrs. James Lovell home.